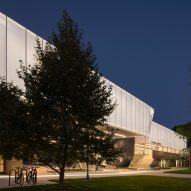 US studio Morphosis has completed a science, design and engineering facility in Michigan, which features a scrim made of ETFE plastic and an entrance stairwell contained within a black orb made of carbon fibre. The A Alfred Taubman Engineering, Architecture, and Life Sciences Complex – commonly referred to as the Taubman Complex – encompasses 36,700 square feet (3,410 square metres). It is located on the campus for Lawrence Technological University in Southfield, a suburb of Detroit. It is among the first buildings constructed as part of a major expansion and renovation effort. The educational facility contains studio spaces, laboratories and offices for various programs, including life sciences, robotics and biomedical engineering. 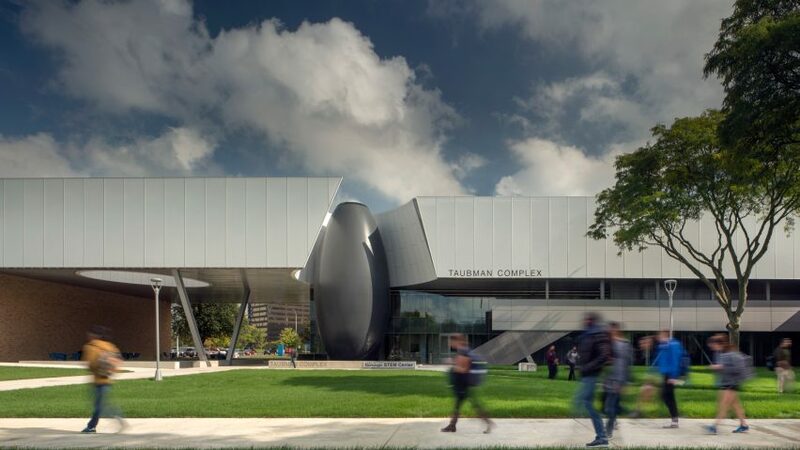 "The design of the building evolved around opportunities to enhance connectivity at multiple scales – between the school's various engineering and design disciplines, previously housed in separate buildings, as well as within existing and future regions of the campus," said Morphosis, which has offices in Los Angeles and New York, and is led by 2005 Pritzker Prize laureate Thom Mayne. To support a growing student population, the Taubman Complex was designed as an "extrudable section" that can be expanded over the years, without diminishing the function and design integrity of the building. The rectilinear bar helps establish a new axis for the campus that strengthens connections between existing buildings and future developments. The building, which is visible from a major roadway, also defines the edge of the campus. The facility's east and west facades are sheathed in a thin scrim made of ethylene tetrafluoroethylene (ETFE), a fluorine-based plastic. At night, the diaphanous veil is illuminated by backlighting. Elevated bridges link the facility to neighbouring structures. The entrance is marked by a large, black orb made of carbon fibre that is positioned above a reflecting pool. The egg-shaped volume contains a three-storey stairwell, with an oculus enabling light to enter the enclosure. Inside the facility, the spine is formed by two floors of laboratories, which overlook a flexible space stretching the length of the building. Clerestory glazing brings soft, natural light into the linear communal zone. "This flex space is the collaborative heart of the Taubman Complex, providing an expansive and re-configurable hall for informal discussions, pin-up critique sessions and lectures," the firm said. The historic multidisciplinary firm, Albert Kahn Associates, served as the project's engineer and architect of record. The firm was started in 1895 by Kahn, an industrial architect who designed numerous American factories for the burgeoning automobile industry in the early 20th century. Kahn and his brother, Julius, developed a pioneering structural system that facilitated open-span assembly floors bathed in light. "The success of these buildings depended on a repeated system of structural ribs and clerestory windows – an efficient, modular formula that could be expanded and extended to whatever size necessary to accommodate the program within," said Morphosis. "A century later, Kahn's innovations are revived in a new expansion for Lawrence Technological University designed to offer flexible laboratory facilities for evolving research and disciplines," the firm added. 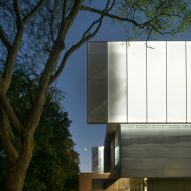 Other recent academic projects in the US include a research facility at New York’s Columbia University by Renzo Piano Building Workshop and a visual arts building in Iowa by Steven Holl Architects.